Editorial: What in the Heck’s Going on at Cap U? One could hardly say Capilano University has enjoyed an unending stream of flattering headlines. Instead, we read about students angry over courses curtailed, petitions from retired instructors living on remote Gulf Islands who were not consulted by the Board of Governors on major decisions, faculty demanding richer pharmaceutical benefits when emeriti, and unflattering – if this were the litigious USA one might even say libelous – statues of President Kris Bulcroft and her quite innocent, I am sure, French poodle. Therefore, donning my red PhD cape, your MLA swung into action. A university which was created on impulse by the previous government but not funded accordingly. A university which has a deserved reputation for excellence in teaching and relevance in the career market. A university which is growing the number of bachelor’s degrees granted in such fields as film production, children and families, and the arts – without abandoning its large and diverse non-degree programs. A university favoured by high school counsellors who fear Johnny or Jane may become lost forever and drop out as first-year students at UBC or SFU. A university which is VERY cost-effective, and probably more efficient in economic terms than any other institution of advanced learning in this province – because they have had to be to survive. So what’s the problem? Not all of the above was accomplished without breaking a few eggs. No doubt toes have been stepped on and not everybody likes change of any sort. And true, life as a quiet community college was much simpler. I have been working with Naomi, Jane, and Jordan — my North Shore MLA colleagues — and other North Shore friends of Cap, brainstorming, representing Cap more aggressively in the corridors of the Legislature, and suggesting possible adjustments in positioning. By coincidence, I had a casual conversation with a waiter at an excellent local restaurant. He said he was studying at Cap U, and thought it was great! In fact, he said, he had originally planned to attend for only two years and then transfer to UBC or SFU but his experience at Capilano University was so positive he now planned to stay the full four years and graduate with a Cap bachelor’s degree. Capilano University is now operating successfully in a demanding advanced education marketplace. It is becoming a university all of the North Shore – and Squamish and Sechelt — should be proud of. We live in a big country. If you were a Fisheries Minister of the Crown living on Prince Edward Island, wanting to visit a vibrant oceanside community to give an award to somebody involved with fish, you might head west, and look up Jim MacCarthy of West Vancouver. Or you might head east, to the community of Brest, France, approximately the same size as our North Shore, and well known for seafaring Bretons and Europe’s biggest maritime festival. Each is bounded by an ocean, the Atlantic on the one hand and the Pacific on the other. Here’s a travel tip: Brest is closer, by about 75 kilometres. 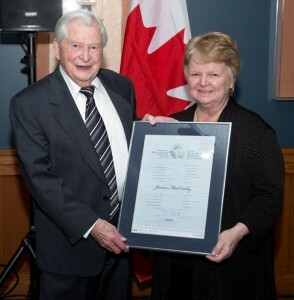 Undaunted by distance, Canada’s Minister of Fisheries and Oceans, the Honourable Gail Shea, made the journey to – why not – the Salmon House on the Hill – to give an award to Jim MacCarthy, of the Coho Festival Society. Drinks flowed, the salmon was baked to perfection, and Honourable Gail’s speech was gracious. James MacCarthy was presented with the 2013 National Recreational Fisheries Award, in recognition of his untiring commitment to community and country – and fish – for more than two decades, building a reputation as a highly respected advocate for our natural environment. Jim has been a major force in the Coho Society of the North Shore since its origins more than 30 years ago. He and his colleagues, such as Bill Chapman, Gordon Adair and Bill Soprovich, raised awareness of the plight of our iconic salmon, and the streams they rely upon. The Society they founded helped put salmon onto the local political agenda, and through the annual Coho Festival, raised about $400,000 for salmon conservation work. Storm drains have been labelled to discourage dumping contaminants into our waterways, and each year, school children “Adopt a Fish” and release young salmon into one of our rehabilitated waterways, such as McDonald Creek right opposite the Library in the centre of town. The promotion of recreational fishing itself, is – ironically—a key conservation strategy. If people are knowledgeable about fish, and want to catch some, they become knowledgeable, and defend fish habitat from destruction. Also, the money they contribute through fishing licences, funds hatchery and conservation efforts in British Columbia. If we want more Coho salmon, we want more people catching them. So who’s looking after seniors these days? There have been a few personnel changes at the top; namely for a few precious months I was the Minister in charge; then my friend Linda Larson took over, and now we have a full-time Seniors Advocate, Isobel Mackenzie, Canada’s first. Michelle Stilwell has recently been appointed Parliamentary Secretary for Health Living and Seniors, reporting to the Minister of Health, while Linda Larson moves over to the “Accessibility” portfolio. My brief role was to shepherd the legislation creating this new position through the law-making apparatus in Victoria. Isobel Mackenzie took charge three months ago, and is an experienced professional who knows the territory. She previously served as CEO of Beacon Community Services, “a community-based, not-for-profit, social, employment, health, recreational, housing and volunteer services agency in the Capital Regional District.” Isobel’s annual budget will be in the $2 million range. Health Minister Terry Lake reported that 130 people applied for the job. The design of this new position was not without a modest degree of controversy. Advocates for the Seniors Advocate had hoped for the equivalent of Children and Youth Advocate Mary Ellen Turpel-Lafond, on leave from the Provincial Court of Saskatchewan, reporting to an all-party Legislative Committee, given an operating budget of about $8 million, and with a mandate to investigate Government agencies. One might say Mary Ellen’s reports have been known to be scathing from time to time. For example, Global News (November 13, 2013) reported that the Wet’suwet’en Nation “came out swinging” when the Representative questioned the disposition of certain children and family development funds in their particular domain. 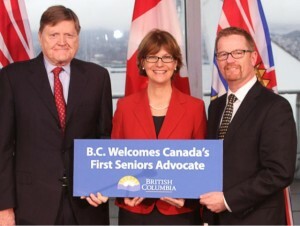 The Seniors Advocate may in time develop a similar reputation, because the law creating her position gives her a great deal of autonomy. She is required to report in to the Minister of Finance – but only once a year. And more regularly, she is expected to report in to the public at large. Her assignment is not to publicize problems, but rather to recommend solutions. One might even say Isobel has been given the tougher assignment. From what I have seen so far, advocates of the advocate, should be pleased. Our government is determined to “re-engineer” our advanced education system. The Minister of Advanced Education has boldly declared his intention to redirect up to one-quarter of the $1.8 billion colleges and universities budget of the province so that B.C.’s growing skills shortage can be met. For an engineer like me, and one who has spent about half of my life in the education system in one capacity or another, these are breathtaking goals. How will they be fulfilled? And certainly even the casual observer must be puzzled by the paradox of our rapidly expanding universities and college enrolments, and an apparently shrinking supply of workers with the advanced technical skills needed by key sectors of our economy. As a result, we import workers from China to work in the coal mines of Tumbler Ridge. There is something not right here – and please don’t say we should not be digging coal out of the ground for steelmaking in the first place. I paid my first-year tuition in engineering at UBC by working as a lineman, building the Kemano-Kitimat electrical transmission line in the early 1950s. They called me a lineman and paid me as one, but in truth I was an apprentice. They knew better than to trust me, 18 going on 19 years old, to safely manhandle a heavy “crab” hand-cranked winch, around a cobweb of steel 135 feet above the ground. But I was learning the trade — safely on the ground. Somewhere, I still have that IBEW (International Brotherhood of Electrical Workers) union card to prove it. But that was on-the-job trades training then, and now is now. To understand better how trades training works in B.C. in 2014, I recently toured BCIT, the British Columbia Institute of Technology. BCIT is big – almost in some metrics as big as UBC! It is packed with students. In 2013 enrollment was over 17,000 full-time students and over 29,000 part-time students. Even more students want to get in, but the waiting list is up to two years and that is a problem in itself – leading Shirley Bond to underline her intention to see a significant re-engineering of a significant chunk of the rest of other parts of our post-secondary education system. BCIT is organized into divisions for computing, applied and natural sciences, business and media, engineering, health sciences, and trades and apprenticeships. I watched young men and women don a welding mask and cut steel with their oxyacetylene torches. I thought to myself – that’s fun, and I learned how to do that when I worked for Linde Air Products many years ago. Not much has changed. I watched a large class of students practising Heliarc welding, and thought to myself, I learned how to do that too. Maybe when the voters toss me out, I can get a job here! The group perhaps having the most fun were a couple of young men I watched wiring a make-believe house. They would wire the house, and then rip the wiring out so the next team could rewire it again. They laughed, kidded around, and I thought to myself, these young men are going to go out, get jobs, probably soon earn $100K annually, and quickly save the down payment for a house. For more information, visit WORKBC.CA/SKILLS. Our government has spent a ton of money creating web-based blueprints and information packages which young people and old, looking to upgrade their skill sets and find a job, will find interesting and helpful.